_Islander brands make every day travel just a little better for hundreds of St. Lucia travelers around the world. Real St. Lucia Tours has been exceeding the expectations of travelers coming to St. Lucia with its unrivaled small group tour experiences. As our professional and enthusiastic Tour Guides tread extraordinary paths through the villages and explore the culture, we invite you to join in on the journey of discovery and exploration. Whether you are looking for a family tour, an active adventure or a cultural journey, Real St. Lucia Tours should be your first choice. St. Lucia Airport Shuttle is a private St. Lucia airport company for ground transportation services. We are experts handling individuals and groups of any size for transportation from the St. Lucia Airports to any location on the island. You will always receive a fast confirmation to your reservation request, our friendly reservation agents will be more than glad to respond to any question you might have about transportation on the island. 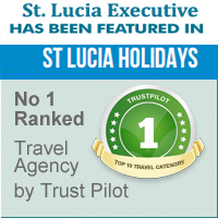 What are our customers and the press saying about St. Lucia Shuttle? 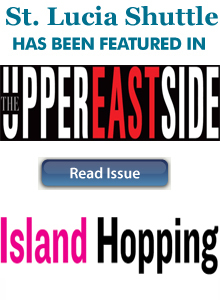 Our brands have been featured in fine publications here's the most recent. STRENGTHENING THE BOND WITH TRAVELERS IN EVERY WAY. A strong connection to our travel family is what sets us apart from others in the travel business. This focus has allowed us to create an extensive network, consisting of travel agents and tour operators across every demographic. We deliver best-in-class service and continue to evolve in an effort to strengthen our commitment to our partners and travel family from around the globe. 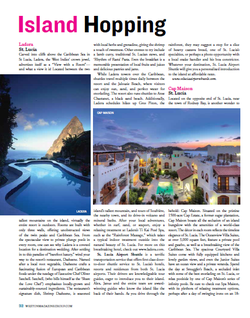 We believe our passion for travel and desire to seek creative experiences is what drives our success. Our team of professional experts prefers partnership arrangements based upon mutual trust and reciprocal benefit, and are happy to collaborate in a variety of ways.